Because we realize that many players do not understand the new system, we thought that it would be the best to create a guide for the new guild HQ system. Question: How is a Headquarters built up and how do we calculate the points? Answer: Each headquarters' building generates a certain amount of points per hour. As you can see, you will sometimes get more or less credited points depending on the buildings' levels, though you should know how to build up the buildings and how long it takes. The time to build up the individual buildings is explained in more detailed here. 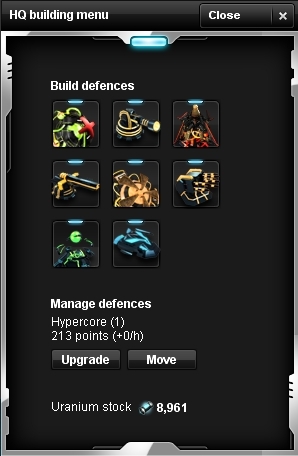 If a guild loses its hypercore - no matter what level - then the hypercore will lose half the points it has accumulated through raiding. As an example, if there are 400,000 points in it, then you will lose 200,000. For the buildings there are no points generated for the ranking. The buildings generate points per hour. Since the patching of the new guild system, the initial value that each guild has started with is made ​​up of 250 hours worth of production points for each building. After the destruction of those buildings they begin new with level 0. This means for you, if your points are lost you can get them back only by your buildings or through raiding other guild's HQ's. Otherwise you will not get anymore points for your headquarters. As you can see in the example above you'll get the points accumulated by your buildings per hour. The points you get by raiding are calculated from the value of the buildings destroyed. Each building has its own value. Each building has collected points for a certain time. For example, if a laser is running until it has 1,000 points and is destroyed, you will get the 500 points credited to your account. You can only see your own points, not those of your opponents. Your Nova Raider INT Team!